HAZELTON – Royal J Blacker, an 80-year-old resident of Hazelton, passed away Friday, May 25, 2018, at St. Luke’s Magic Valley Medical Center in Twin Falls. He was born December 10, 1937, in Rupert, Idaho, the son of Thomas LeRoy and Hilda Mary Widdison Blacker. He attended school at Pioneer Elementary, Rupert High School for three years, and, in 1956, was a member of the first graduating class of Minico High School. He subsequently furthered his education at Brigham Young University where, in 1961, graduated with a degree in agriculture economic. He married his eternal companion, Marilyn Moncur, on April 8, 1960, in the Idaho Falls LDS Temple. Royal was drafted into the United States Army in 1961 and served in Germany for two years. Following his honorable discharge, he returned to Rupert and began a career with Amalgamated Sugar Company as a field man. He was transferred to Homedale, and was a field man in the Homedale and Adrian, Oregon area for eight years. In 1972, he and his family moved to Hazelton where Royal began to farm with M & B Farms and later had his own entity, Blacker Farms, where he tirelessly worked for many years. For the past 13 years he has worked for Star Falls Ag, Inc. He was the president and director of the Northside Beet Growers association for 20 years and from 1994 until 2000, was a member of the board of directors of Snake River Sugar Company Additionally, he served on the Hazelton City Council. 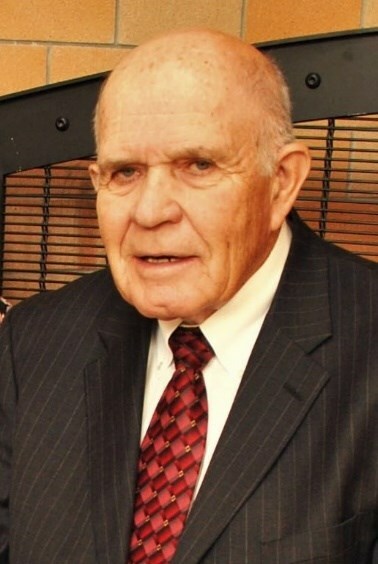 As a lifelong and faithful member of The Church of Jesus Christ of Latter-day Saints, Royal served in various callings including: bishop of the Hazelton Ward for six and one-half years and with his final calling, he was privileged to served for the past nine and one-half years in the Twin Falls LDS Temple - a calling he dearly loved and, a special and sacred place where he made many wonderful and eternal friends. His life was devoted to the Savior and his family. His testimony was strong and he taught by example. Spending time with his sons, their wives, grandchildren and great-grandchildren, brought him great joy. He loved to travel to see historical and LDS Church history sites. He spent many hours with his sons, farming and attending their sporting and other events. He was a devoted BYU fan and enjoyed many fun tail-gating parties with good friends and family. He also was a passionate and voracious reader. Royal was preceded in death by his parents; his brother, Leon; a baby sister, Lola Jean; and one brother-in-law, Lavon Koyle. He is survived by his wife of 58 years, Marilyn Blacker; three sons, Royal Jay (Lisa) Blacker, Gary Kent ( CharLynn) Blacker, and Gregg Eric (Catherine) Blacker; three sisters, Arlene Koyle, LaRae (Charles) Thompson, and Louise (Fred) Wilson; a sister-in-law, Judy Blacker; 13 grandchildren; and five great-grandchildren. The funeral will be held at 11 a.m. Friday, June 1, at The Church of Jesus Christ of Latter-day Saints - Hazelton Ward, 531 Middleton Ave., with Bishop Ray Moon officiating. Burial will follow at 3 p.m. at Rupert Cemetery where military rites will be provided by the Mini-Cassia Veterans Group. Friends may call from 6 until 8 p.m. Thursday, May 31, at Rasmussen Funeral Home, 1350 E. 16th St., in Burley, and from 10 until 10:45 a.m. Friday at the church prior to the service. The family expresses their sincere appreciation to Dr. Eric Allen and Dr. Juergen Bertram, their staff, and the caring nurses at station 4 of St. Luke’s Magic Valley Medical Center, for their kind and considerate care of Royal during his illness. The family suggests memorials be given in Royal’s name to the General Missionary Fund of The Church of Jesus Christ of Latter-day Saints or to a charity of choice.